Have you ever stopped to wonder what supervillains do when they take a little bit of time off from being evil? Does Thanos like to take a monster camper to a nice quiet corner of the universe? Is Voldemort a fan of small travel trailers and partial to an off grid adventure with his Death Eater pals? While the list of speculative nerdy questions that I could ask you could go on forever, one thing that we’re all sure of is how the Lord of the Sith likes to spend his time away from the Death Star. When ‘darkstar van life’ starts to look a little bit tame, Darth Vader calls in the big guns for family holidays with Luke and Leia. Meet the worlds first Carbon Fiber Caravan, the most robust travel trailer in the galaxy. Caution – This article contains an obscene amount of Star Wars references. If you haven’t watched any of the films or don’t enjoy them, then it could end up being a harrowing read. This off road trailer could be the most insane off grid caravan that I’ve ever seen. At 35 feet long it just manages to fit inside our tiny homes category, and it’s the only off grid trailer in existence designed like Kylo Ren’s helmet. 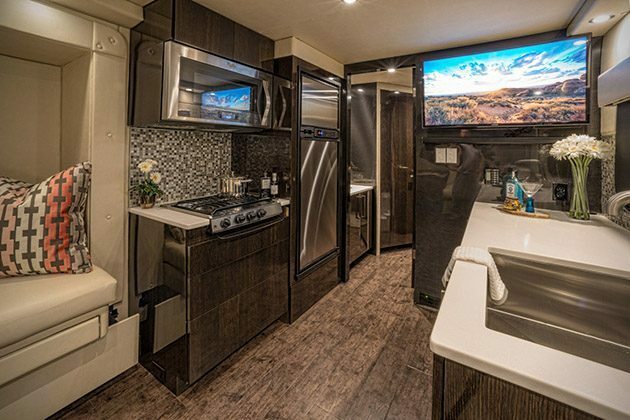 If you’re a weekend warrior searching for a tiny trailer than look away now, but if you’re a lord or lady of a galaxy far, far away with more money than midi-chlorians, then read on! Are you a weekend warrior or a full time van lifer? Join our brand new Facebook Group and meet our ever-growing community! I never thought I’d say this, but it’s time to forget about the EarthRoamer. While the biggest adventure bus on the planet is custom made for off grid exploring, it’s position as king of the campers has been snatched from underneath its gargantuan tyres. 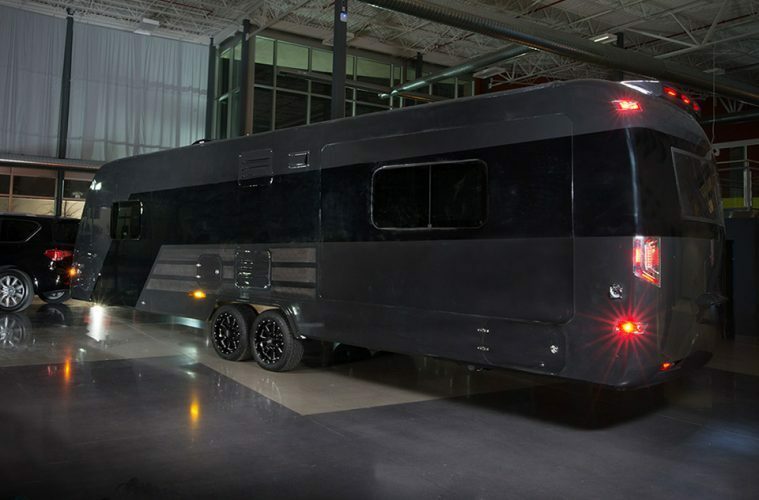 Meet the CR-1 from Global Caravan Technologies, the worlds first Carbon Fiber Caravan. With more technology crammed inside than the latest iPhone, this caravan is more robot than a tiny home, which makes my inner geek insanely excited. Unlike it’s best friend C3-PO, the CR-1 cannot speak multiple different languages or walk comically, but it is the most advanced camper trailer that you’ll ever see. With a body built entirely of Carbon Fiber, the CR-1 takes the light, durable qualities of an F1 car and twins them with a luxury living space fit for an Emperor. This Carbon Fiber Caravan is made to be towed behind an SUV, so if you own a lightweight electric campervan, then you might need to upgrade before purchasing the CR-1. Doubling up as a tour bus when Darth Vader heads out on his intergalactic ‘Meet & Greet’ tour, the CR-1 instantly makes any owner 100% cooler and is guaranteed to increase your friendship pool by at least 50% (these facts aren’t confirmed by the manufacturer, so you’ll just have to trust me on this one). 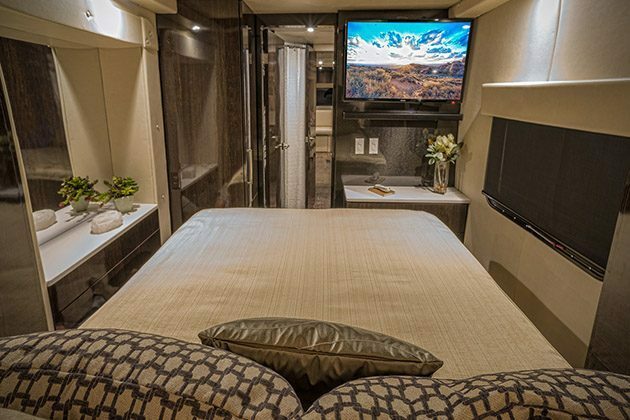 The CR-1 Carbon Fiber Caravan uses magic-tint windows that can be blacked out at the touch of a button thanks to the smart technology system running throughout the entire camper. Now you don’t even have to get out of bed if you want to close the curtains! The camper has two awnings in case you and your partner fall out and want to sit on opposite sides of the trailer), and access is through a neat looking side door that blends seamlessly into the side decal. 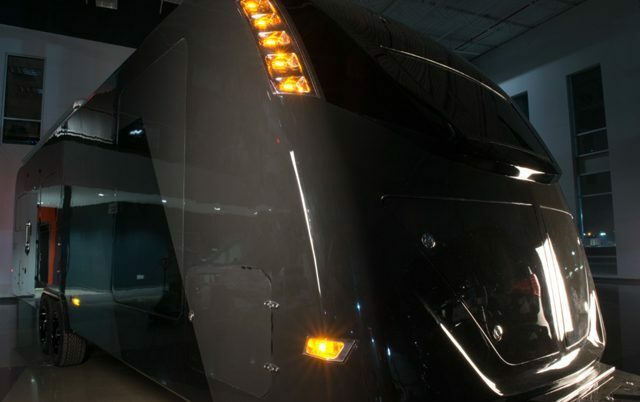 What’s Inside This Carbon Fiber Caravan? It would probably be easier to tell you what’s not inside it, but here goes. Tiny house and trailer life lovers everywhere will be able to appreciate the sheer amount of skill that has gone into the CR-1’s interior. It looks more like a swanky pad that you might find in the centre of London or Berlin, except the only difference is that you can move this tiny home when you get bored with your surroundings. Let’s start with the kitchen, the home of all top cooking accessories and where the real magic is made. Food is essential to any successful camping trip, and this Carbon Fiber Caravan makes it incredibly easy to make gourmet meals on the go. You’ll have access to a multi-range stovetop and a microwave for quick meals when you’ve had a long day on the trail. There’s a large refrigerator that looks as though it’s big enough to keep all of the food in your village fresh, and a massive flat screen T.V that you can watch your favourite series on while cooking. You can also add a washer and/or dryer into the equation too if you so wish, but we make do with the scrubba wash bag just fine. There’s also a designer Kohler faucet too; it won’t make the water taste any different, but it’s a cool talking point! The main living area looks just as impressive as the kitchen, with plush leather seating and more Carbon Fiber elements throughout. 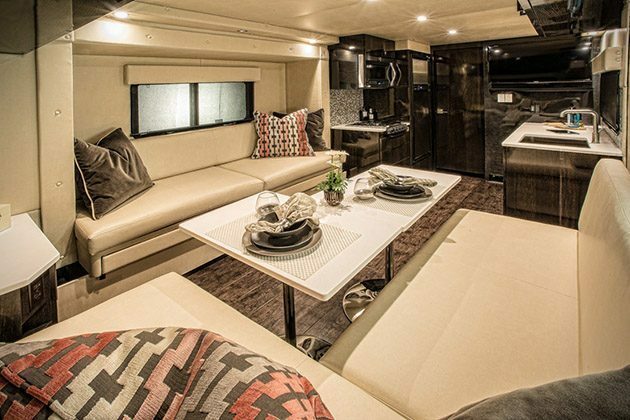 The CR-1 seats eight people in total, and those sofas could easily double up as beds for guests or friends that you make on the road. 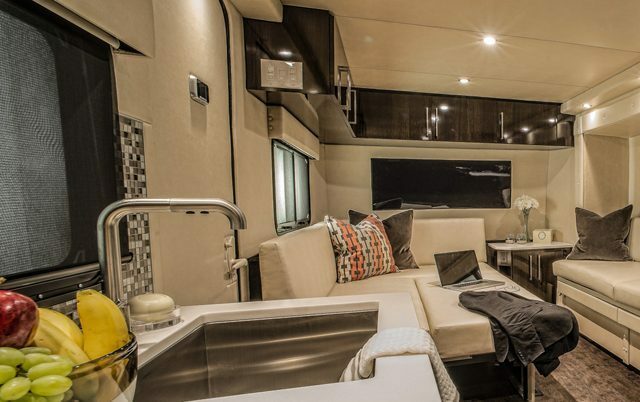 The lounge area also doubles up as a workstation, making this Carbon Fiber Caravan great for the digital nomad who lives for the Lando Calrissian lifestyle. You won’t be short on storage either, with overhead cupboards running the entire length of the living area and spreading out into the kitchen. Organising your belonging can be tough while living off grid, but this Carbon Fiber Caravan has so many hidey holes and hidden storage that tidying away won’t be a problem. Finding your stuff when you need it might be a bit tricky though! This trailer also has a master bathroom complete with a shower (and shower curtain to boot!) and a master bedroom with, you guessed it, another huge flatscreen tv. The bedroom comes with a dressing table and tonnes of clothes storage, a large mirror, and a window that you can open to fill the room with the smells of nature. This is where the CR-1 Carbon Fiber Caravan gets even more interesting. A user-friendly computer system can be accessed by an app on your laptop, phone, or tablet to control pretty much every digital feature of the camper. You’ll be able to check battery capacity, change heating and solar parameters, tint the windows remotely, access T.V channels etc. The list is endless. Now you can ‘use the force’ to make things happen without even getting up off the sofa. If the 700W solar power system isn’t enough to keep the 300AH battery storage charged, then this Carbon Fiber Caravan also comes with a built-in generator to cope with the sheer amount of electricity it gobbles up. The satellite TV system will more than likely grant you access to every single Star Wars movie on demand (even the disappointingly dull new ones), and an onboard WiFi router will ensure that you never lose signal ever again. Now you can FaceTime all of your friends and show them how better than them you are. This Carbon Fiber Caravan is an immense vehicle for people who like to ‘live large’. 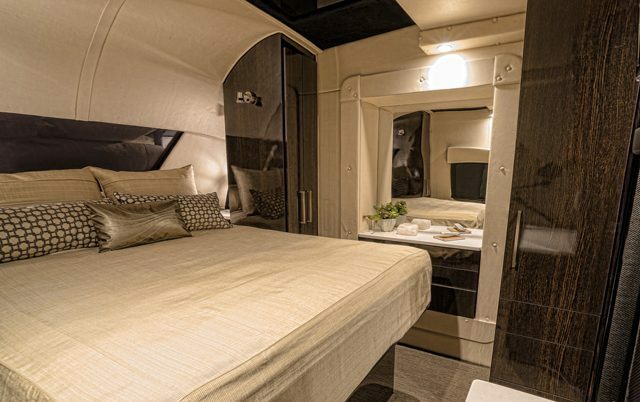 It’s certainly not the way that I would envisage living the van life or travelling in a van, but for some people comfort and luxury is everything. I personally enjoy looking at nature rather than massive flat screen T.V’s, but they have their uses if you’re taking a long journey with the family or enjoy a few rounds of Mario Kart before bed. The CR-1 isn’t something that you would take to your local nature reserve to ‘be at one with the world’, and you would have to do your research to find free park-up spots that were big enough for you to back into or turn around in. It’s not the most practical of caravan’s, but I don’t think it’s the type of thing that you would purchase if you were solely interested in a vehicle’s function. We’ve tried to find a price for this Carbon Fiber Caravan online and had no luck, which means that the price tag probably has lots of little zeros on it. One magazine described it as ‘looking like a million dollars’, and I wouldn’t be surprised if it cost somewhere near that figure to buy. 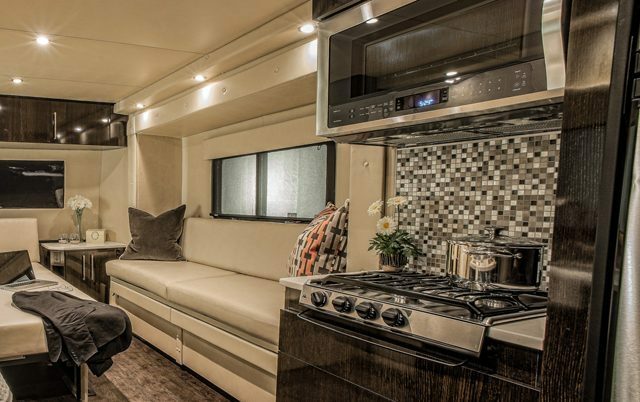 It’s a great luxury pad and the perfect trailer for anyone who has everything, but I think I’ll be sticking to small travel trailers for my alternative living ventures in the future. What are your thoughts? Join us on Twitter, Facebook and Instagram and let us know whether you love or loathe this Sith-tastic Carbon Fiber Caravan! Meet the VW Camper made for big spenders and bigger weekends! Treat yourself to one of these amazing campervan gifts. These handy vanlife tips will help you to achieve off grid glory!